After making 12 crockpot freezer meals from Costco in November, I couldn’t wait to go back. 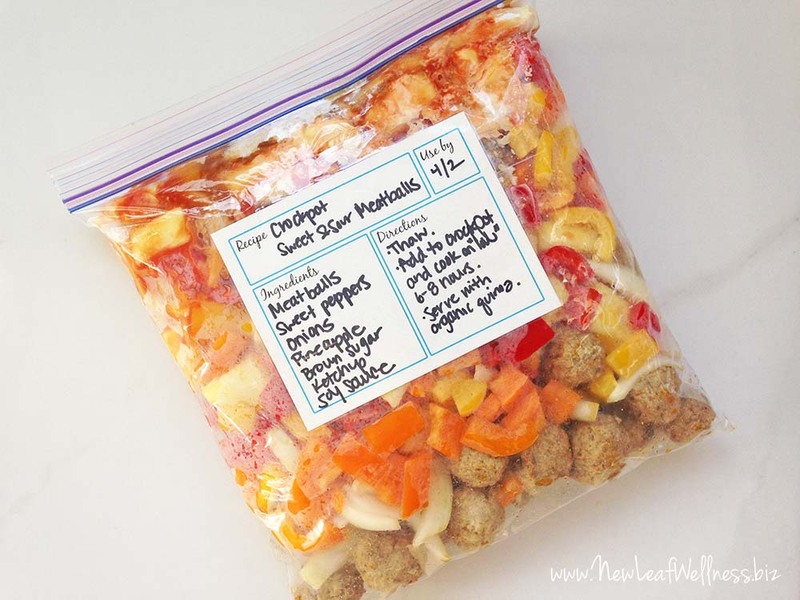 I had my eye on a big bag of frozen meatballs and spent the past few weeks coming up with ways to use them in crockpot meals. I headed straight to Costco and you can bet I bought that big bag of frozen meatballs, along with the ingredients to make six make-ahead crockpot meals. Add a few simple side dishes and we’re set with six delicious, family-friendly dinners. Perfect for busy weeknights! Now, if you are a “real foodie,” then these probably aren’t the recipes for you because they feature store-bought meatballs. But, never fear – I’ve shared tons of other freezer cooking sessions on this blog that might interest you. 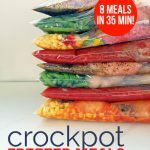 Start here: Eight Healthy Crockpot Meals or Crockpot Meals With Vegetables That Only Cost .94 Cents Per Serving. Personally, I’m a big fan of “all things in moderation” and these meatball recipes fit the bill perfectly. They all include vegetables and are 100x healthier than what we’d get at the drive-thru. I usually prep my freezer meals over the weekend when my husband is home playing with our daughters, so it was a treat to have the house alone to myself. 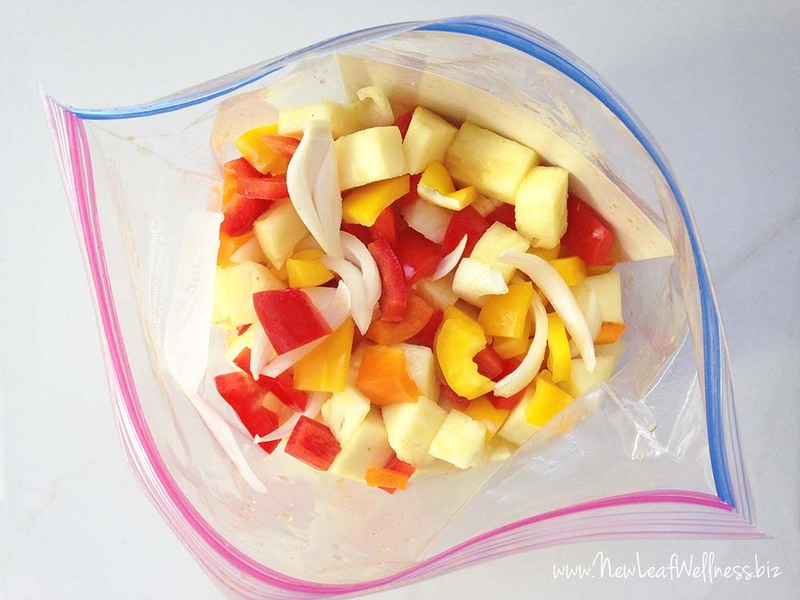 I played some music on my iPhone and got right to work prepping my make-ahead crockpot meals. I decided to make the crockpot meatballs first because I literally only needed to combine the meatballs and sauce in a bag. It took all of sixty seconds and necessitated the second happy dance of the day. 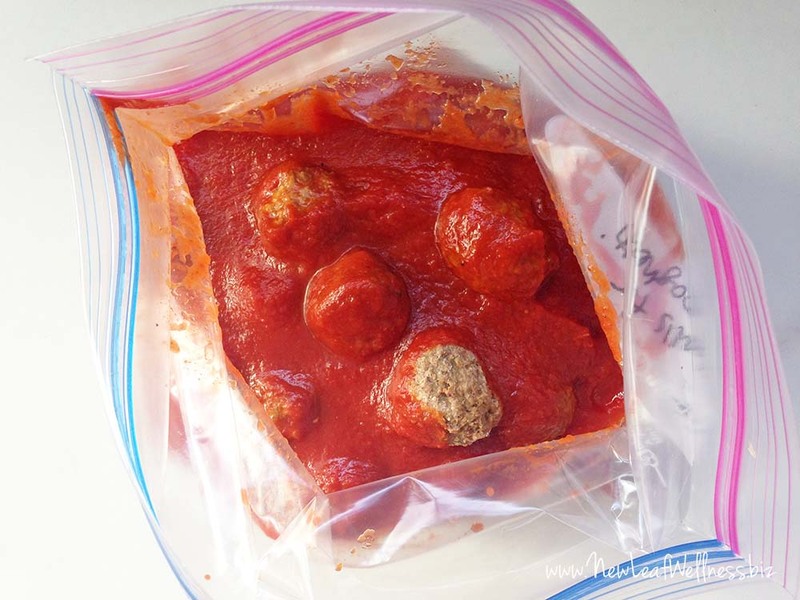 I can tell you that we already ate one of the bags of meatballs in sauce, and all I can say is, “YUM.” I served it with spaghetti and a big salad, and now I can’t wait to make the second bag in the freezer. Overall, I spent $45 at Costco on the ingredients and 40 minutes prepping all six meals. Since these meals were so easy to make, I was able to finish them quickly without rushing. I even filled out my freezer meal labels (which I typically try to do ahead of time) and cleaned up. 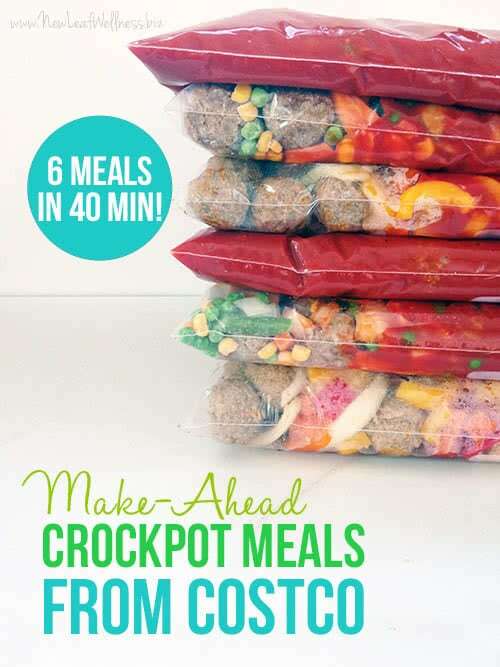 If you’re brand-new to make-ahead crockpot meals, the recipes in this pdf above will walk you through the process step-by-step. These particular recipes barely require any measuring, so they’re great for beginners. 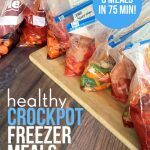 For more information, you can also check out my blog post with eight healthy crockpot freezer meals and my No Cook Freezer Meals cookbook. I see you have 4 different cook books. are the recipes in each book the same or different with more recipes. I like the ones you have shown but, dont want to buy a book with only 6 maels in it. 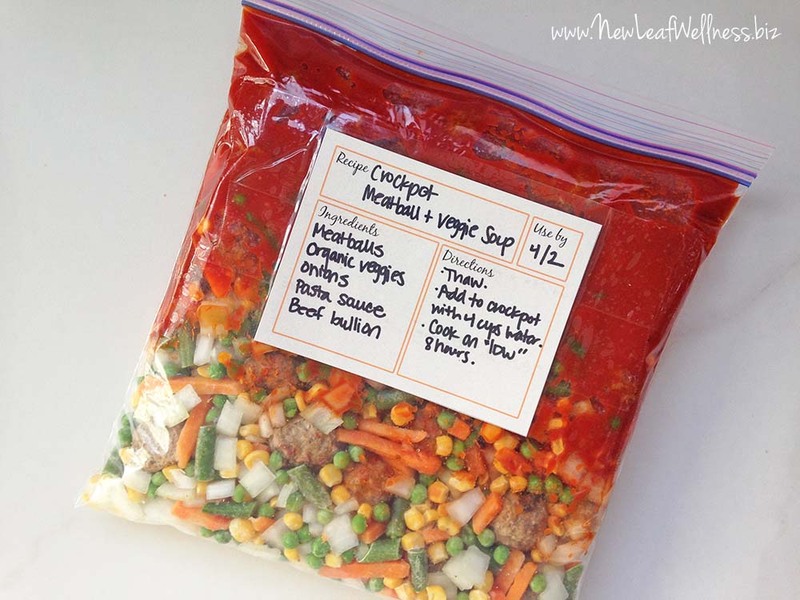 15-Minute Freezer Recipes has 10 recipes and a grocery list to make all 10 of them. Easy & Healthy Slow Cooker Recipes also has 10 recipes and they are different than the ones in the 15-Minute book. 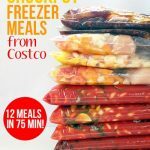 No-Cook Freezer Meals has 18 recipes, but some of them are from the slow cooker cookbook, but adapted for the freezer (It also contains a grocery list for all 18). Hope that helps. More info about all three is on my website here: eBook Bundle. Do you know how much brown sugar, soy sauce, and ketchup you put in the bag for the sweet n sour meatballs? If you look at the printable pdf, you can find the details for all of the recipes. Hope that helps. Do you these feed a family of 4? If so is s pretty good portion? I see that you use freezer bags. I know that they take up less space. Do you reuse them? Not usually. But, if you wash them, I’m sure you can. I can’t stand peppers so I made the Sweet and Sour Meatballs without them. I loved them. Husband loved them. The kids loved them. I really do want to use more veggies though and normally I try to add them to the main dish. Any ideas of what to use instead of the peppers? Hmmm, how about zucchini and/or yellow squash? I think even carrots would work. Hi there!! These all sound so good, and am thinking of making them this weekend. But you say, 1 pound of meatballs. I dont own a food scale, so approx. how many meatballs did you put in the bags?